Download SP Flash Tool for Windows and Linux. 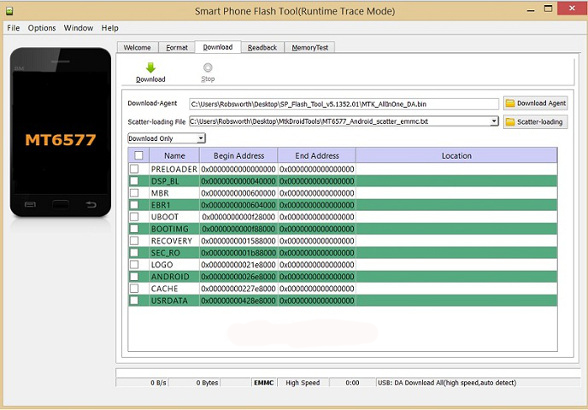 SP Flash Tool / Smart Phone Flash Tool is a handy application that you can use to perform firmware flashing from PC to your MediaTek (MTK) Chipset based device. Aside from that, you can also use SP Flash Tool to fix some technical problems such as. Forget your pattern lock combinations. You can flash .img file to your MediaTek chipset device. You can use it to make test and verify RAM and Nandroid (ROM) and also your external memory (SD Card). You can use SP Flash Tool to format your NAND, EMMC and SDMMC flash (External Memory) partitions. This utility is to manage several parameters such as OTP parameter and others. This feature can read the available memory capacity and the content from your device's memory (Firmware and data partition on Nandroid). ReadBack is also known as Firmware Dumping process. This contains several menus to customize your SP Flash Tool, to arrange how to download or flashing firmware. This is a new feature from SP Flash Tool that allow you to run SP Flash Tool through Command Prompt (CMD for Windows or Terminal for Linux). Can also be used to flash custom ROM. Not only to flash firmware or stock ROM, SP Flash Tool can also be used to flash custom ROM developed by third party Android developers to your MediaTek (MTK) device. You can download the tool based on your computer operating system. Any question should be revealed on the provided comment area. For you to remember guys. [*] Compatibility. This tool can run on either Windows or Linux OS computer. [*] How to use. To use SP Flash Tool can be found on. [*] Nulify your warranty. Your warranty will be nulified if using this tool to flash a modified or custom ROM. [*] Another Tool. There is another tool that can be used to flash a firmware on Mediatek device which is Sugar MTK Flash Tool. [*] Credits. SP Flash Tool is created, maintained, developed, optimized and distributed by Medaitek Inc. Therefore all the credits must be given to the name guys. Via download SP Flash Tool All Versions.